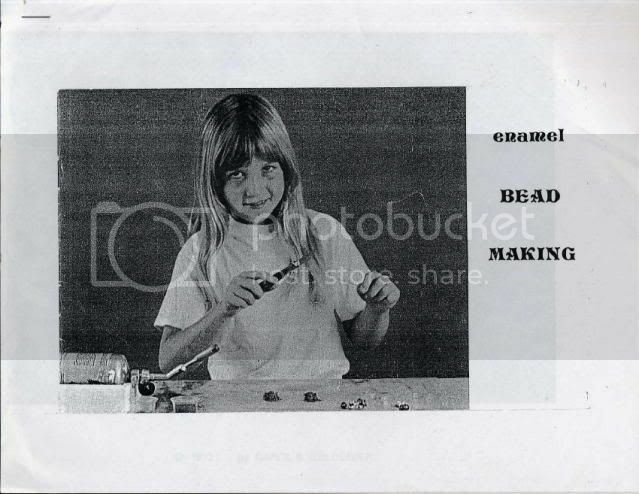 This is a booklet on making enamel beads, on a base of soft copper tubing, commonly referred to as refrigeration tubing. Using a propane/MAPP torch as a heat source. A couple of years ago this was pumped up to be an amazing and recent thing. It has been around longer than most people thought. This 14 page booklet by Thompson Enamel is a basic course in glass bead making. Covering the equipment need to start with a couple of colors of enamel frit( lump enamel of a certain size). Torch/torch head, Stainless Steel TIG rod that fits the copper tubing,A/10 Flux, stainless steel knife used for removing the tube/bead, a swirling tool( a pointed section of Tungsten TIG electrode works great(glass doesn’t stick to it), heat proof work surface they still have asbestos sheet listed. The only other thing that is helpful is a graphite smooth flat block, for smoothing and shaping the hot glass. It is easier than the knife. It will take you step by step thought the complete beading making process. About the only difference with more current books is the use of a crock pot on med/high heat filled with garden vermiculite ( it is the safe version) to slow down the cooling of the glass on the copper tube to avoid cracking (4 to 6hrs). When you are done with making the beads you unplug the crock pot, when it is cool they are done. As you can overheat the first couple of beads and they can crack. One other note, in my area of Michigan, a lot of stained glass shops also sell the Glass Rod, Lump Frit, threads and tools like the graphite maven. Or there are a large number of online shops.